Republican gubernatorial candidate Brian Kemp attends the Election Night event at the Classic Center on November 6, 2018 in Athens, Georgia. Kemp is in a close race with Democrat Stacey Abrams. Kemp, aka the wizard of voter suppression, said he could finally resign because his true work of punching the black vote in the face was complete. Oh, and he wanted to work on his transition team now that he’d successfully made sure mostly-black areas had one voting machine with a three-inch plug. According to NBC News, Kemp holds a slight lead over Stacey Abrams, but the race remains too close to call. 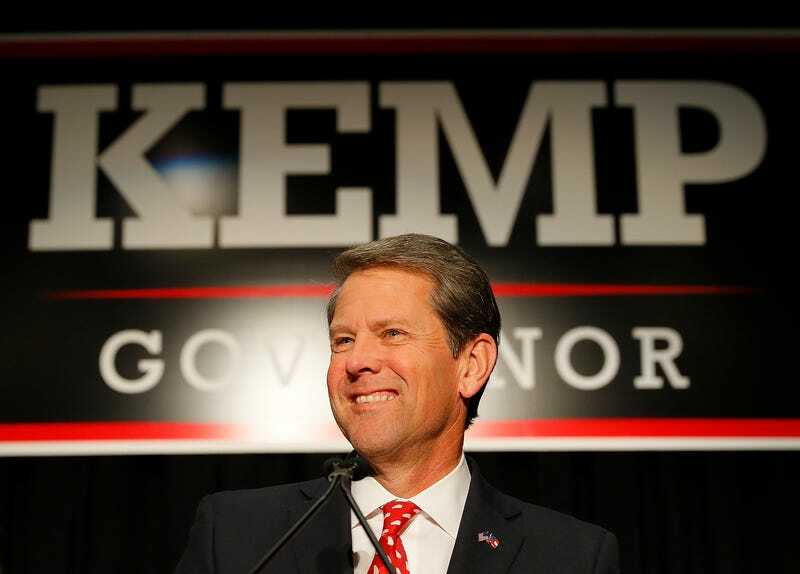 Current numbers have Kemp leading Abrams 50.3 percent to 48.7 percent. NBC News notes that as more ballots are being counted for Abrams, the closer the race becomes, the more likely this fiasco is headed for a runoff election. Abrams’ campaign believes there are enough outstanding votes – excluding the votes stuffed inside a crushed Honda Civic trunk – to force a runoff. “If Abrams is able to gain slightly more than 23,700 votes on Kemp, the race is pushed into a mandatory recount. If she can gain about 25,600, it is forced into a runoff,” NBC News notes. So now we wait in the hopes that the 30,000 votes buried in Kemp’s backyard are somehow discovered. Fine. The Root has no proof Kemp has hidden votes in his backyard. Is Lena Waithe Hollywood’s Biggest Sneakerhead?